Born and raised in San Diego, Mr. Peterson graduated from La Jolla High School in 1978, San Diego State University in 1982, and from the University of San Diego School of Law in 1986. He is a member and officer of the Supreme Court of the United States, a member of the State Bar of California, the San Diego County Bar Association, the County Bar Real Property Section, and Lambda Alpha International. 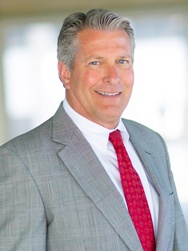 He has, served as Co-Chairman of the Metro San Diego Political Policies Committee of the Building Industry Association of San Diego County and as Co-Chairman of the Environmental Law/Land Use Section of the County Bar Association. He was appointed by San Diego City Council to the San Diego Stadium Authority Governing Board, where he has served as Chairman and was then appointed by Mayor Susan Golding to serve on the 1998 San Diego Super Bowl Task Force. Mr. Peterson currently serves on the UCSD Foundation Board of Trustees and serves on its Stewardship Committee. He also serves on the Advisory Board of the La Jolla Community Foundation (affiliate of the San Diego Foundation). Mr. Peterson is very active in children’s rights issues, and has served on the Rady Children’s Hospital Foundation Board for over 18 years and participated as a member of the Board Development Committee. Previously a “Miracle Maker” in the Children’s Hospital Telethons, he currently serves on the Rady Childrens Hospital Board of Advisors, and for the last 4 years volunteered in the Activity Room every Monday in the Acute Care Pavilion. Recently, Mr. Peterson participated in a Mission Trip to Malawi in partnership with Y- Malawi, World Vision, Opportunity International Bank and the Nkhoma Hospital to address issues such as starvation, health care, nutrition, micro finance, and faith. As part of a professional certificate program in Land Use and Environmental Planning, he taught “Urban Planning and Development Law” and other land use courses at the University of California and San Diego Extension for a number of years. He has also lectured at UCSD, USD, SDSU, and at PLNU as part of the Masters Program in Business. Mr. Peterson focus is in land use, real property, redevelopment, environmental, coastal, historic, port, and airport development law. He provides consultant and legal services to property buyers, owners, and developers on due diligence and site assessment matters, and has served numerous times as an expert witness and has testified in complex litigation cases involving land use and real estate matters. His practice emphasizes municipal and governmental advocacy, including permitting and processing of discretionary and administrative permits, subdivisions, approvals and property development entitlements, as well as neighborhood code compliance and zoning violation matters.